Belle, like 12 Years a Slave, is a movie about race and, indirectly, slavery. Like that film, Belle is based on a real-life person: Dido Elizabeth Belle, born 1761m daughter of a relationship between a Caribbean female slave Maria Belle and British naval Captain [later Admiral] Sir John Lindsay. He seems to have brought her back to England to have the child, but her eventual fate remains a mystery (died in childbirth?) On his death in 1788 the London Chronicle described her as his "natural daughter, a Mulatto who has been brought up in Lord Mansfield's family almost from infancy." "Dido" may have been an affectionate nickname: in classical literature Dido was the beautiful and clever Queen of Carthage who eventually killed herself for love. But it is significantly different from that film, and others such as Mandingo, Django Unchained, Lincoln and The Autobiography of Miss Jane Pittman, in the way it approaches its controversial topic. For Belle sees race through the very English perspective of class, status and family ties. The violence associated with racial prejudice is not the concern of this film. Instead, Belle's subject-matter is the impact of race on the late eighteenth century English class system and the aristocracy. It also investigates the intriguing family background to the famous 1772 Somerset Case, in which England's Chief Justice Lord Mansfield ruled that no slave in Britain could be forcibly removed and taken back into slavery. Historians have speculated that Mansfield's ruling may have owed something to empathy for slaves inspired by the part the the notably kind-hearted, the childless Chief Justice (and his wife) played in Belle's upbringing in England alongside other members of his family. For Belle's father sent her to England, to be raised in the care of Mansfield, who was her grand-uncle. The Chief Justice and his wife were also raising Lady Elisabeth Murray, Dido's cousin and about her age, whose mother had died early. Elisabeth's father was an important diplomat, frequently posted abroad. Tom Wilkinson plays Lord Mansfield in the movie. Engraved image of Belle's father, John Lindsay. He had at least two other children out of wedlock. Wilkinson as Chief Justice Mansfield in "Belle". Romantic scene: Belle with John Davinier. The movie plays fast and loose with the few known details about the foreigner who was eventually to marry Belle. The movie blends historical fact with cinematic fiction. It shows the historical reality of Belle's upbringing at Kenwood House, the estate of Mansfield and wife, with her cousin. Lady Elizabeth left Kenwood after she married in 1785, a year after the death of Lady Mansfield. Mansfield himself never fully recovered from his wife's seat and seems to have increasingly relied on Belle to help him with his voluminous correspondence. Belle also portrays the older Belle's relationship with John Davinier. However, the movie's Davinier is basically an imagined character. Belle did indeed marry a John Davinier in 1793, at the very fashionable St. George's Church in Hanover Square - in itself a sign of her social respectability, (Handel worshipped there and in the musical My Fair Lady it's the church where Alfred Dolittle gets married as evidence of his new-found respectability.) Davinier appears to have been a Frenchman employed as a 'gentleman's steward'. In the movie, he is an idealistic young lawyer, assisting the Chief Justice. The real-life couple had several children -three sons were baptised at St. Georges. She died in 1804 and was buried at St.George's Field, near what is now Bayswater Road. During the 1970s the graves were disinterred to allow 'development' and the remains removed - but where? The painting above left is very significant, from both the point of view of art history and and from the perspective of social and cultural history. The portrait, once attributed to Johann Zeffany, is titled Dido Elizabeth Belle and Lady Elisabeth Murray. Its setting is Kenwood, Mansfield's family great estate at Hampstead, London. (Note St. Pauls in background) The two young women depicted are Belle and her cousin, Elisabeth. This pleasant portrait is a revealing social document. It is one of the first English portraits that allots equal importance to a coloured woman and a white woman. The two are obviously on good terms with each other. The mixed race Dido, and the white Elisabeth are both clothed in expensive styles that proclaim their shared elevated economic and social status. Elisabeth is closer to the front and her fuller dress makes her seem slightly more dominant. She is holding a book, suggesting a more intellectual element. Yet the viewer's attention is drawn to Dido. Her expression is vivacious, and her pose alluring and confident. She seems livelier and more impulsive than her cousin; she is certainly not a meek and subdued social inferior. In a subtle touch, the artist has painted this dark-skinned girl in a white dress and set her against a light background while her white cousin is highlighted against a dark background. The exotic aspect of Dido is enhanced by her wearing a turban and carrying a basket of fruits. Even today, as in the late 18th century, St.George's Church ( shown above) in Hanover Square was very fashionable and the scene of many high society weddings. Handel worshipped there when he lived in London and today the Church is the focus of many classical musical events and performances. Dido and, later, her three sons were baptised in this socially prestigious church. 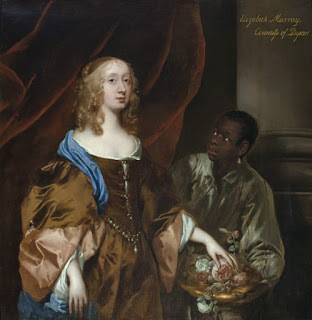 Note the artist's portrayal of the slave below with his owner, the powerful and controversial Lady Elizabeth Murray. She is imperious, he is cowering. He is obviously a servant. She ignores him, despite his physical proximity. He is an object of no importantance to her. The slave is smaller, anxious and suppliant. The contrast with the Belle of the 'Zeffany' painting above is obvious. She is depicted as confident, cheerful, lively and virtually an equal with her white cousin. The differences between the two portrayals suggest that in the late eighteenth century English mindsets about slaves was changing. Lady Elizabeth Murray and Servant: 1750s painting. There are two significant aspects of Belle's life that are examined in the movie. The first involves the perennially fascinating subject of English upper-class manners and class consciousness. Belle was raised, along with her cousin, in a wealthy and socially distinguished family whose patriarch was Britain's most important judge. Yet, from an eighteenth Century viewpoint she did not belong in such an elevated setting. Her mother was apparently a slave , but it's uncertain what happened to her- according to one account Lindsay arranged for her to go to Florida. Belle was, legally, illegitimate, possessing no family rights. And of course, she was of mixed race. To many people this signalled social and racial inferiority, rendering her unfit for the 'polite' family society in which she lived for decades. Her social role was thus decidedly ambiguous . Hutchinson's account suggests the social difficulties of Belle's status at Kenwood. She did not join the family at dinner yet she joins them for a walk and is obviously friendly with a 'young lady' (Elisabeth). She has been given an education (an indication of social status) and 'pert' (presumably self-confident). She has been given a responsible job in the household. Mansfield's affection for his mixed-race grand-niece has obviously been the target of slurs. Mansfield also relies on her to assist him in his work. • received total yearly allowances of 30 pounds 10 shillings. A kitchen maid's allowance was 8 pounds. Elisabeth's allowance was 100 pounds - an indication of the difference in status between the two cousins. • she received expensive health care - teeth extractions, asses' milk (a tonic at that time). • when Belle's father John Lindsay - who had become an admiral and had received a knighthood died in 1788 - his will bequeathed a thousand pounds to be placed in a trust for his two surviving children out of wedlock: "Elizabeth" [Belle] and John. • an obituary for Lindsay pointedly praised belle's "amiable disposition", claiming that "her accomplishments have gained her the highest respect from all ... [Mansfield's] relations and visitants." • Lord Mansfield bequeathed Belle 500 pounds (approx 110 000 US $ today) plus an annuity of 100 pounds (20 100 approx US$ today) for life. She also received a bequest of one hundred pounds from another family member. A very useful income, plus another 500 pounds as her half-share in the trust above. • When she was older, Belle was given the duties of supervising the Kenwood estate's poultry runs and dairy yard. When Mansfield was older, she acted as his secretary, including writing correspondence for him. As Mansfield was a man with extensive intellectual, political and social connections, this suggests that Belle herself had received a good education otherwise matters such as spelling and syntax would have been beyond her. Did Belle influence Mansfield's ruling on slavery in England? Jpseph Emidy, former slave, and a major figure in classical music in early 18th Century Cornwall. 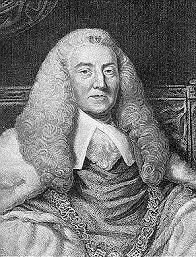 The movie takes it for granted that the experience of a having the mixed-race Belle in Mansfield's household was a major influence on the Chief Justice's attitude towards slavery and motivated his famous judgement. Historians have also considered Belle's presence as a family member, and her obviously pleasant and lively personality, as well as may well have been a factor in his indignant attack on slavery and in his very careful and rather limited ruling about the status of slaves in England. Yet Mansfield's humane and generous personality, intelligence and his intellectual interests and influences suggest that he would have opposed slavery regardless of his fondness for his mixed-race grand-niece daughter of a slave. Many others in the social and political circles in which he moved, in the second half of the eighteenth century were determined to put an end to slavery. Hence the rise and influence of groups petitioning Parliamnet to abolish the slave trade and slavery itself. In English popular art and entertainment of the time , blacks are increasingly depicted not as servile or despised, but as accepted members of a social group (servants in above left) or as participating in a cultural / social event along with whites (the musician Joseph Emidy, a former slave who became a well-known and respected violinist and composer in Cornwall. Mansfield's ruling was a major factor in the British campaign to abolish the slave trade. Petitions ot Parliamnet were a key tactic of the anti-slavery movement. The Somersett Case, 1771-2, on which Mansfield gave his famous (but carefully restricted decision) was widely reported in newspapers of the time. Mansfield's 1772 ruling in what is known as the Somersett Case is one of the most famous in English history, an important one for Britain's American colonies and a landmark in the history of slavery. But it's also one of the least understood. The judgement was the result of what was in effect a test case. Somersett was a runaway black slave in England whose owner, a rich Virginian planter, wanted to establish his property right to take the runaway back to Virginia. A n influential group of English anti-slavery advocates fought the case. They relied on the ambiguity of the legal status of slavery in England, an ambiguity that Mansfield's ruling did not remove. Significantly, in his will Mansfield stipulated "I confirm to Dido Elizabeth Belle her freedom", which shows that Mansfield was determined to make sure that an earlier grant of freedom from slave status was made unchallengeable and unambiguous. As Mansfield pointed out in his decision, the status of slavery in England could only be decided by legislation. Contrary to popular opinion, Mansfield did NOT emancipate slaves. Nor did he rule that slavery was illegal in England, although he ruled that it was not , contrary to the claims of slaveowners, supported by Common Law. ( Although it was illegal in Scotland, which had its own legal system.) Instead, Mansfield's decision meant that it was not legal for a master to take a slave away from Britain by force back to the 'colonies' i.e. America. And he did not proclaim that "England was too pure an air for slaves to breathe in" - this statement had been made in a 1569 case. However, Mansfield did condemn the institution of slavery in terms that greatly encouraged anti-slavery advocates and angered slave-owners in the American colonies. He claimed the institution was "odious". His verdict - and his condemnation of slavery, coming from a respected pillar of the British establishment - was a victory for the increasing number of Britons determined to end slavery in the empire. As Mansfield argued, the illegality of slavery and the slave trade could only be decided by Parliament. In 1807, a couple of decades after the American colonies became independent, Parliament passed the Abolition of the Slave Trade Act. In 1833 Parliament declared slavery to be illegal throughout Britain and the empire. Kenwood Estate, residence of Lord Mansfield and his wife, and Dido's home for many years. It is located near Hampstead Heath. Part of the 'Dairy' which Dido supervised later in her life at Kenwood.